Test your endurance. Race your friends for the best time through this wild obstacle course. Check the stopwatch and see if you can beat the best time down and back! 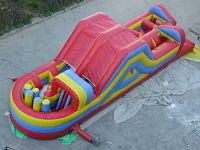 This inflatable obstacle course will be an amazing centerpiece in any event. Manufacturer boasts that 150 kids per hour can use this unit! Great choice for schools! Interested in a 2nd inflatable? You get $50 off your second inflatable priced $100 or more!